Lunch At Jackson's - Go Big Or Go Home! 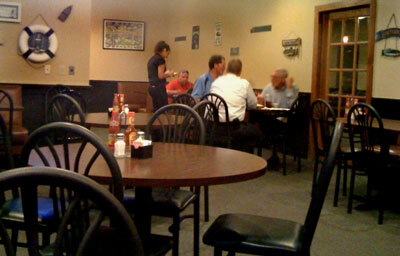 A welcome addition to the lunch and dinner options on King Street in Jacksonville's Riverside neighborhood is Jackson's. When I lunch I'm not always watching the clock, so I've come to consider Jackson's a place to come and relax for a leisurely lunch. I read or catch up on my active Words With Friends games and enjoy the relaxed ambiance. Service is friendly and the kitchen pumps the food out fast enough considering its all made from scratch on the premises. Let's start with the burgers - 8 oz of handcrafted USDA Black Angus beef - served with all the fixin's and a piping hot side of fries - it's to die for. 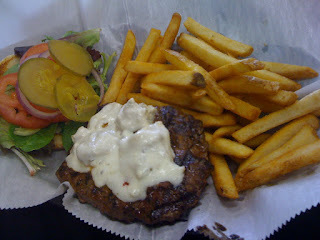 I love the Blue Cheese Burger - $7.75 Thick and delicious and stacked with fresh toppings. For the Chicken lover - there is a seriously HUGE Chicken Salad Sandwich - $7.95 and something called the Snow Bird - with thick slices of chicken breast and avocado. Salads, soups, wings, rings and fried 'shrooms round out the pub-grub menu. On each visit I've been treated to a lagniappe - usually a tasting portion of their "guaranteed" chicken gumbo. And every time, I really want to like it. But it breaks down like this - thick, brown roux with the occasional shred of chicken or sliver of onion. The flavor is "brown" and texture is what I imagine concrete to be like before it is set. We ordered a cup of it on one visit and couldn't get even halfway through it. Not that it's bad, its just too, well, beige. 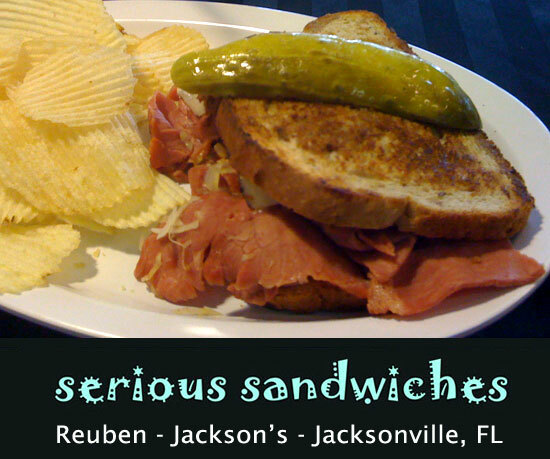 No matter - the real star of the show at Jackson's is their delicious sandwiches. 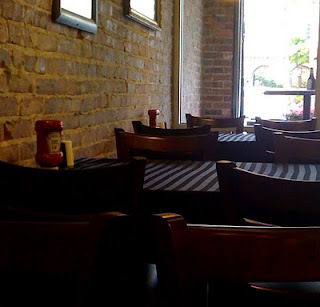 The building renovations at Jackson's have revealed a warm interior with exposed brick walls and mosaic tiled floors. Warm wood tones, black tablecloths and prints of vintage sports teams complete the urban casual look and feel of the place. They were open for breakfast for a brief stint, and we hope they will be again some time soon. 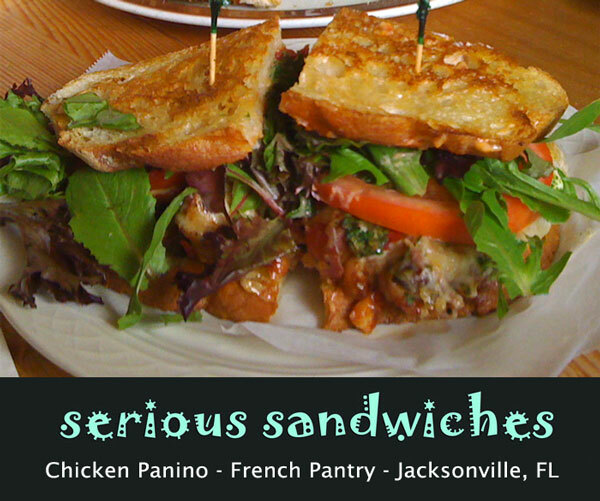 Until then we'll settle for lunch at Jackson's - meet you on King Street! Kentucky Hot Brown - A 1920's Classic! The creation of Chef Fred Schmidt of the Brown Hotel in Louisville, KY, the Hot Brown is an open face sandwich featuring turkey and bacon, smothered in Mornay Sauce and cheese, then baked or broiled until bubbly hot and browned. Tomato adds a light note to this truly decadent and SERIOUS SANDWICH. Special thanks to old friend, photographer extraordinaire (and fellow foodie) David Francis of Lexington, Kentucky, for this mouthwatering photo of a classic Hot Brown from Spud's Tavern in Lexington. Apparently the Hot Brown is the American cousin to the Welsh Rarebit. 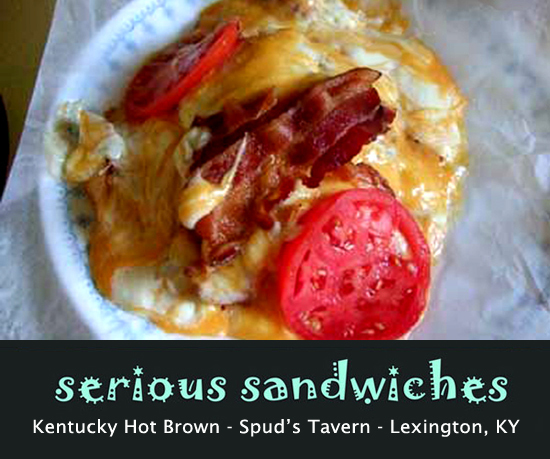 I first encountered it when I lived in Cincinnati - where it was referred to as a "Kentucky" Hot Brown. I gather that in Kentucky they just call it a Hot Brown. I call it over-the-top cheese-a-licious. Seafood Summer has come to an end, although it is still pretty warm here in Ponte Vedra, and let's face it, seafood is always in fashion at the beach! My new favorite thing to obsess over is: SANDWICHES! Who know there were so many great ones out there? I'm gonna do my best to share some of my faves with you - and I hope you'll do the same! 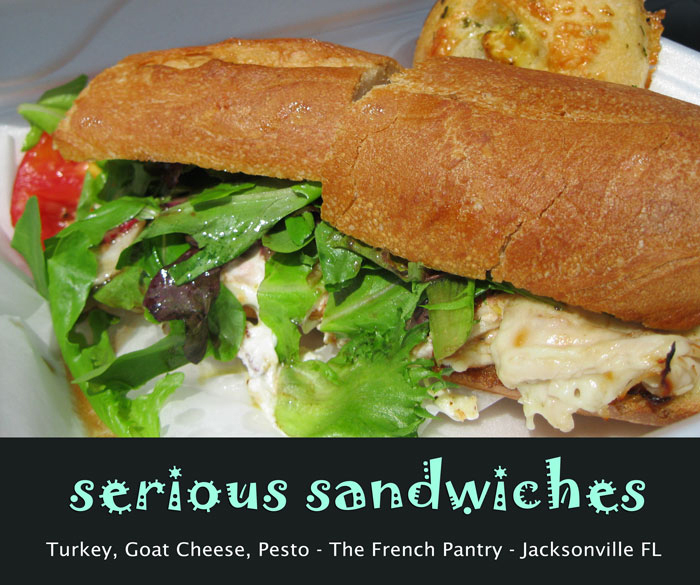 Jacksonville and the Beaches - Where do you go for a great sandwich? And for my out-of-town friends - If the beasties came road-tripping through your area - where and what is the one sandwich they should seek out? 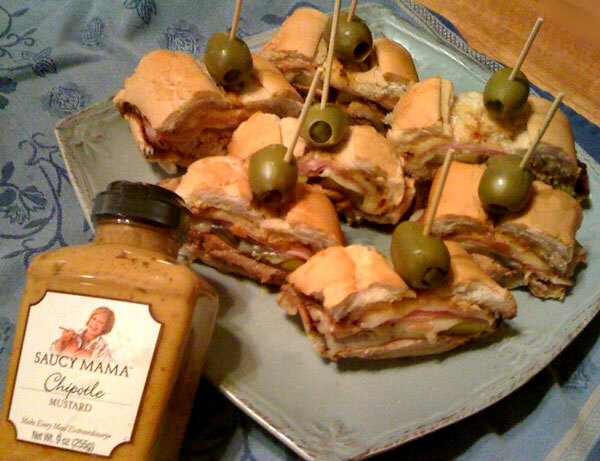 Just for fun - we entered an online recipe contest and developed these delicious party noshes - a take on the traditional cuban sandwich, using not one but THREE Saucy Mama products from the folks at Barhyte Foods and the Saucy Mama Cafe! The pics were a hit on facebook so we thought we'd share here. Enjoy! Puncture meat all over to create openings for marinade. 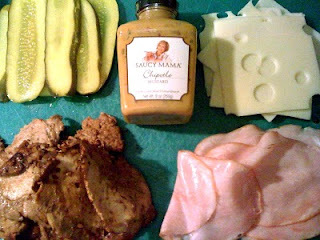 Pour one bottle of Saucy Mama Cracked Pepper Marinade and the fresh lime juice in a large plastic zip top bag along with the pork loin, close and shake to coat. Set the bag in a shallow pan and marinate overnight in the refrigerator, turning a few times to allow marinade to permeate. When ready to cook, bring to room temperature. Remove pork from the bag and place in a shallow glass baking dish. Pour on the remaining marinade and bake in a 350 degree oven until internal temperature has reached 165 (approx. 2 hrs.) Remove from oven and allow to rest until meat is cool enough to slice. 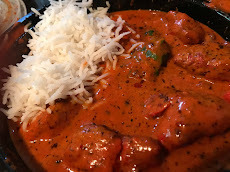 You could do this a day ahead – If so I recommend thinly slicing the meat, returning it to the pan to absorb the juices and brown peppery goodness, then storing in an airtight container in the refrigerator until you are ready to use. Bring to room temperature before you proceed. Authentic Cuban loaves work best but if you can’t find them, French baguettes will do. Slice the loaf lengthwise and flatten both halves slightly with your palms or a heavy skillet. You may want to remove some of the white bread from the inside top of the loaf, to allow more room for the delicious fillings. Brush each cut side liberally with Saucy Mama Chipotle Mustard, and lay them cut side up on the board. Line with fillings –sliced swiss cheese, peppered roast pork, sliced ham, then the pickles. More cheese on top, then pull the two halves together and cut into two equal pieces (to get into the press or skillet). Toast sandwich in a panini press or large skillet (oil if needed for your cooking utensil – I don’t add any and it comes out fine as long as you watch and don’t scorch it). You just want a good crunch on the bread and melting of the cheese. Once it is toasted to your liking, remove the halves to the cutting board and skewer them through the top with short skewers topped with a Saucy Mama Jalapeno Stuffed Olive. Each half loaf can be cut into four small slices of sandwich – each with a skewer to hold it together. For 24 pieces you will need to use 3 whole loaves of bread – but I caution you – you’ll want leftovers! Are you America’s healthiest cook? Riverside Arts Market (RAM) will feature the Aetna Healthy Food Fight’s regional competition, showcasing two full days of food preparation competitions and celebrity chef judge Sara Moulton! 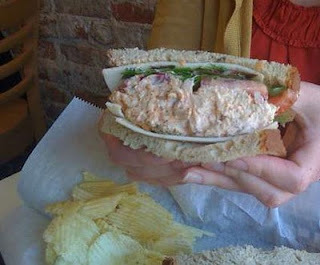 As our fabulous Seafood Summer winds toward the finish, we've been sampling seafood at some of your favorite every day eateries - seafood spots that serve it straight up and simple - so grab a napkin and tuck in! Juniors Seafood is on Jacksonville's Northside - 9349 N Main St - just off of I-95 - and completely worth the trip even for this Ponte Vedra foodie. 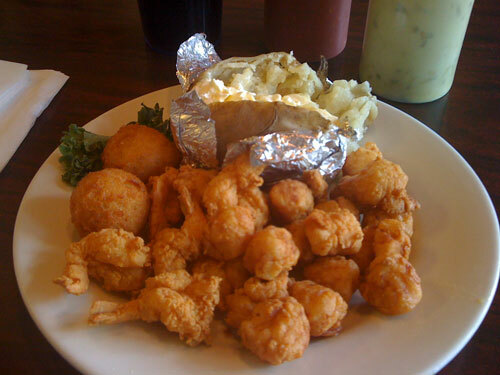 On the 15th or 30th of the month they offer a 30 piece Shrimp special for $9.99 (pictured is the 20 Piece Fried Shrimp). 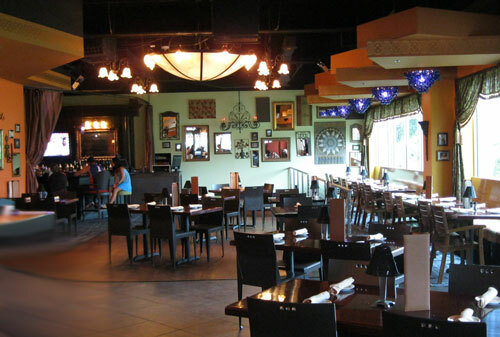 Junior's has an extensive menu, great service and good food, prepared simply and served fast. The place is sparkling clean, and the staff are very friendly and helpful. There are plenty of options for the non-seafood eater - and even the sides and apps are awesome - check out these farm fresh Fried Squash! Home made desserts look great too! 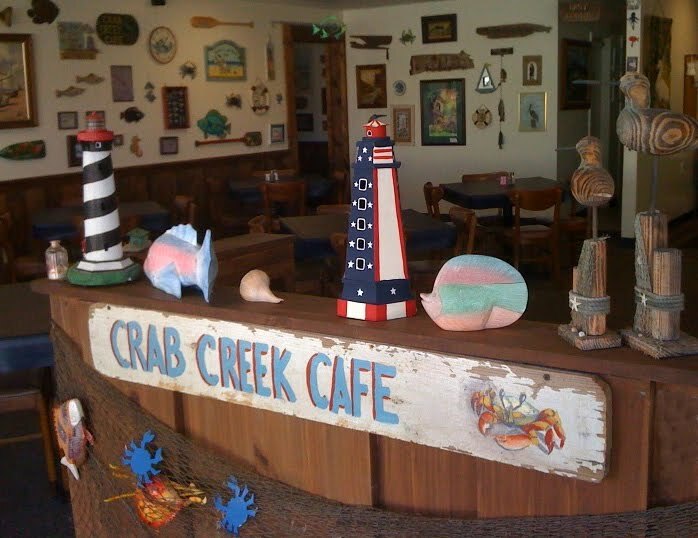 Another Seafood Summer find is Crab Creek Cafe in Arlington. One afternoon I was headed to Atlantic Beach when I spotted this gem at Atlantic and Arlington. It certainly takes the prize for kitchy mariner decor! Reviews on social sites have been mixed, mostly siting slow service. 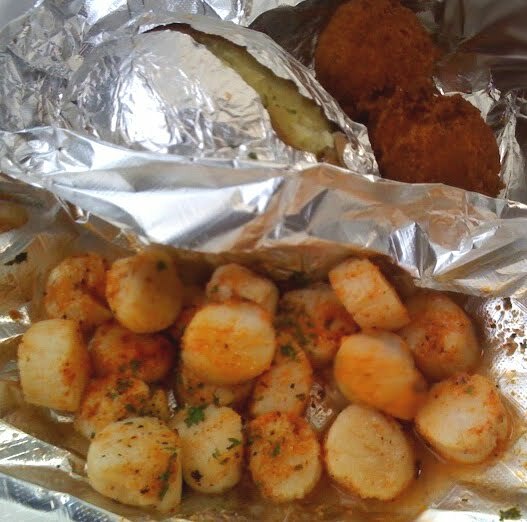 I've only done take out here, and limited my selections to the standard - Broiled Scallops were buttery sweet and cooked perfectly. The real star of this show (for me, anyway) and the item that will keep me coming back - is their Conch Fritters - some of the best I've ever had! 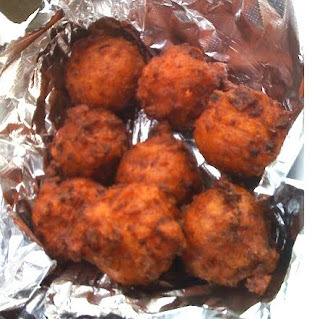 Hot pillows of dough studded through with large strips of tender and tasty conch - almost more conch than fritter - and served with what seemed like a spicy orange marmalade for dipping. 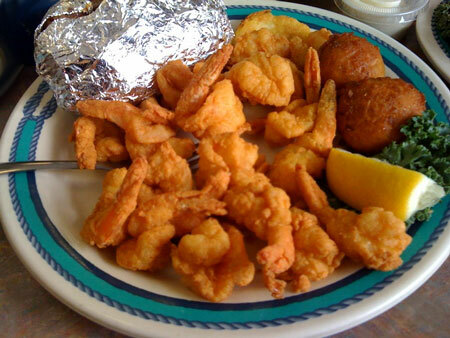 Seafood restaurants are ubiquitous in Jacksonville. Any cross-town drive is likely to garner at least one sighting. 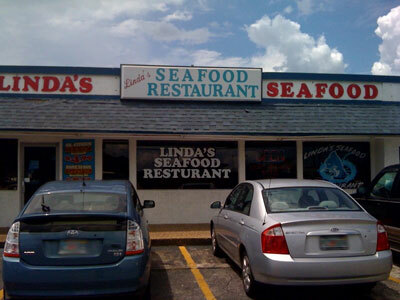 One we've driven past for a while now but just recently dug in and checked out is Linda's Seafood and More on Lane Avenue in Jacksonville's west side. The waitress gets flustered if there are more than four tables of customers, and I have heard her actually snap at diners on more than one occasion! 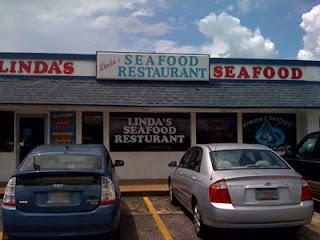 So why will I go back to Linda's? 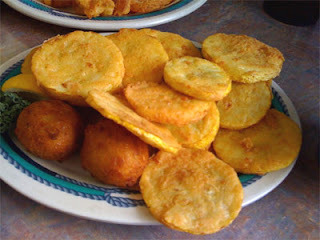 Fried and fried. Their breaded, fried fish and seafood is great. I'm not likely to try out anything else on the menu. 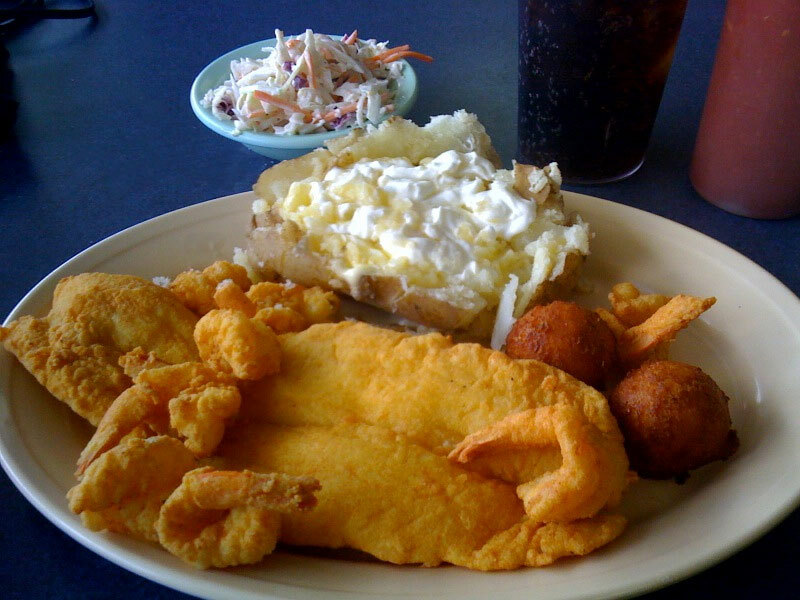 The coleslaw is a cut above the typical seafood shack fare, too. Creamy but crunchy, and not too sweet. "Fried and fried" and fries rule the day here too. This lunch platter of shrimp and scallops is about as exotic as I want to get when I visit a place like Sam's St Johns on Jacksonville's westside. Nothing to write home about decor-wise, Sam's is nevertheless a neighborhood standby for the simple seafood loving set. I managed to get there three or four times this summer, and the food and service were always spot on. These are just a few of the many, many spots you can drop into and grab a simple yet soul-satisfying plate of seafood in Jacksonville. 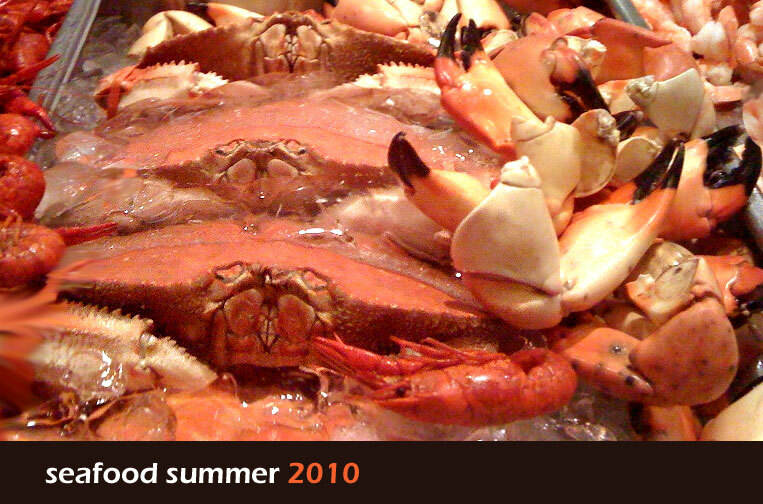 Enjoy what's left of your Seafood Summer! Just a quick note to say WELCOME to Karma - new kid on the block in Ponte Vedra. I stopped in for lunch on Saturday and really liked what I saw AND tasted. The staff were friendly and full of suggestions - what's good, what to have with it, what each evening's live music performances are like. They've been open about a month now. Dinner and late night is their main scene, but they are open from 11 a.m. on Saturday and Sunday, and the bars have a couple flatscreens - so you can watch the game in style. 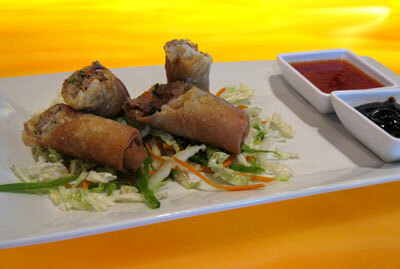 Karma offers "Global Eats and Cool Vibes" - and they deliver both! Check out their website for a 360 view of the decor, and some tantalizing shots of the food. I'm ready to head back there! On my first trip I had to try the Fried Spring Roll with hoisin roast pork filling and sweet chili and plum dipping sauces. ($4.95) - the pork had great flavor - it was a little dry (which helps with frying the wrapper) but the sweet chili sauce really made the dish come together. 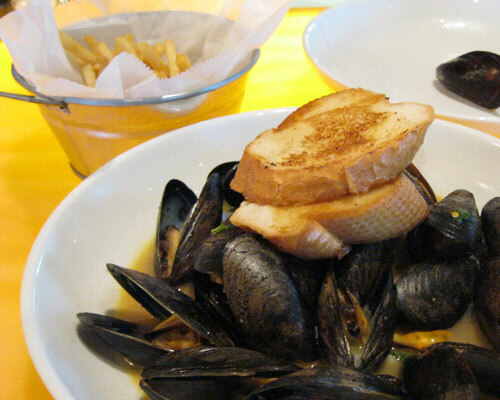 I asked for mayo to dip my fries, which they gladly provided, along with a little bowl of fresh ground horseradish in melted butter for dipping the mussels - one of those handy waitstaff suggestions that turned out to be a revelation to me. I'll always eat them that way now. Saturday and Sunday they also have a brunch menu - with two for one mimosas, poinsettias, blood marys, etc. - and there is a late night menu for after hours noshing - Happy hour from 5-7, nightly drink specials. Oh, and they clear out some of the tables after dinner service, to make room for dancing to the live music. Hmmm. I could use a little more life in my nights. See you at Karma!